I have a wonderful group of friends Carol, Joyce, Kim and Cathy and we have been meeting to sew once a month for years. 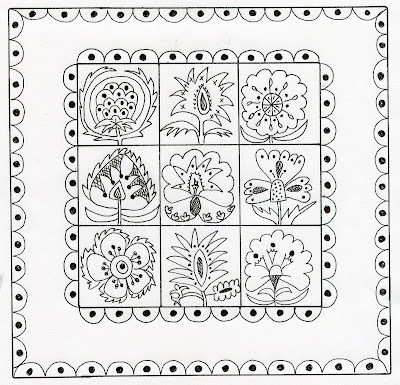 Many of my quilt and sewing project designs where started in this group. This has been a busy year for all of us and we have not meet as many times as we would have liked. Last Sunday was a good catch up day. We missed Kim but the rest of us had a lot of fun playing around making these fun little owls out of wool. 10 ladies joined me in my home for an embellishment class. Fun was had by all as they worked on their own pieces. 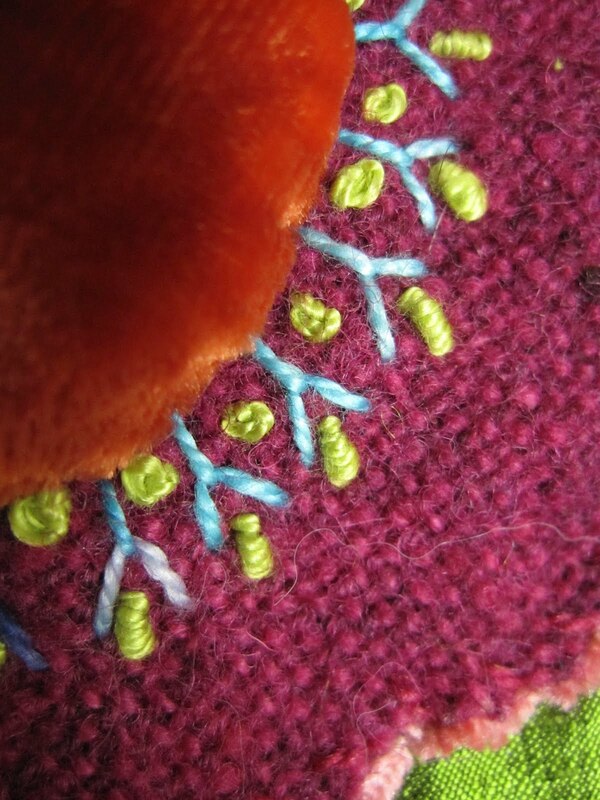 We had fun working with fibers and stitches. I had a wonderful weekend teaching at Olive Grace. I taught my Thistledown Table rug and an embellishment class. They have an amazing classroom and provided a wonderful sit down lunch. Many thanks Diane and Monica for making me feel so welcome. Cathy travelled with me to Pennsylvania. 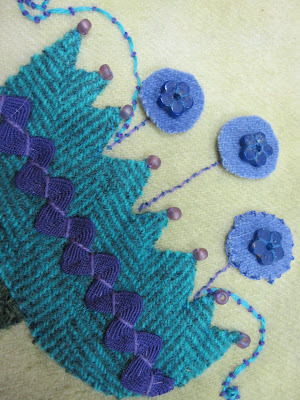 I taught a class using one of my small kits working on wool appliqué and a little embellishment. 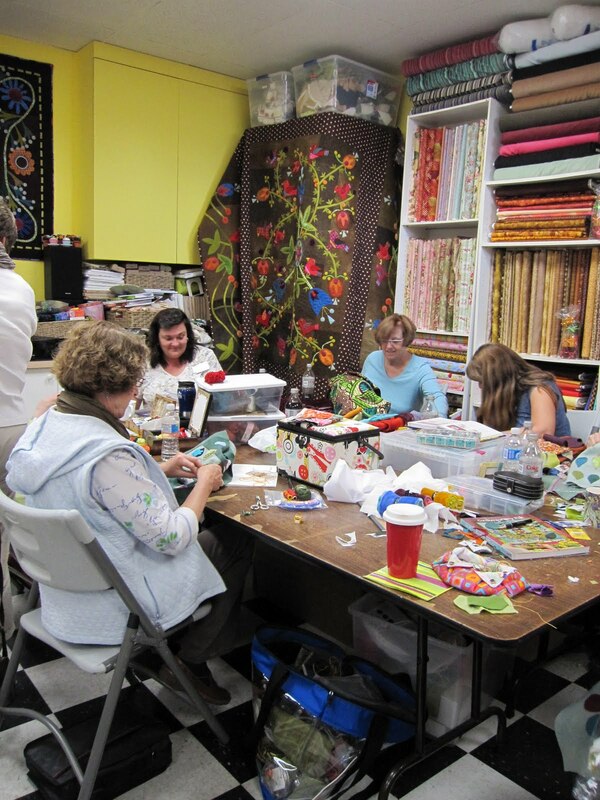 I had a wonderful group of enthusiastic stitchers. I also gave three lectures at the guilds. The weather was perfect and the fall colors were magnificent on our drive over. I gave a lecture at the guilds annual luncheon. 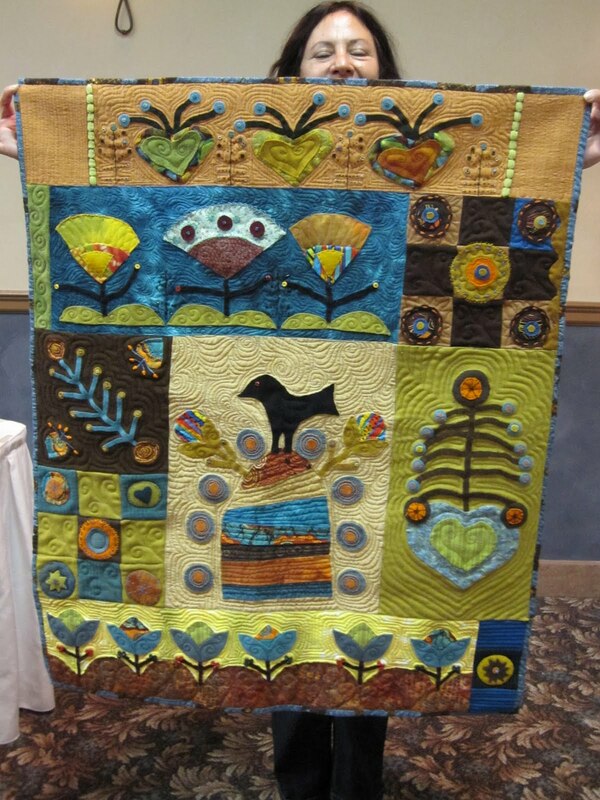 My friend Gabriel shared her colorful ‘Ginger Grove’ quilt she had just finished. Here is a sneak preview of partial of the 2010 BOM which is drawing to a close. 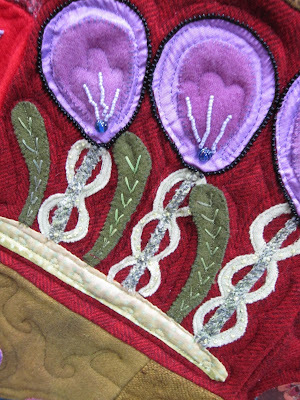 I have a couple more hours applique to do then it will be completed. I have thoroughly enjoyed stitching this quilt. Hopefully it will be done for the holiday season. I am blogging from Detroit airport as I am traveling to WI to teach this weekend. 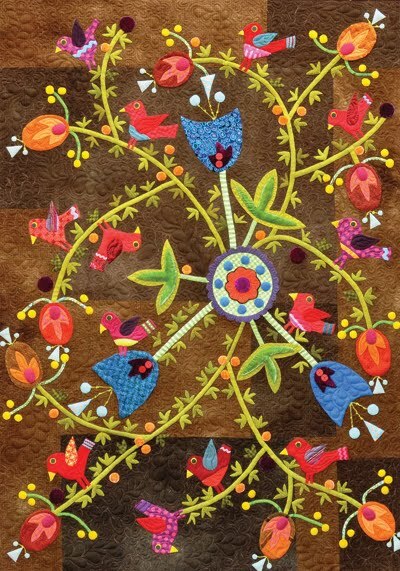 Today Heather and Megan at Quilt Story have featured my ‘Robin Run the Hedge’ Quilt. Please visit their fun blog at quiltstory.blogspot.com Thanks so much for such a great write up. On the down side we are running a little late with the newsletter this month due to all my traveling. Then yesterday our computer crashed and as of right now we have lost everything back to December 2008. Very frustrating but we are all handing in there. Lots of extra work to do! Mary and Clarice have moved their store the ‘Rabbits Lair’ to a wonderful new location here in the historical district of Rogers, AR. It is bright, with wonderful light and very inviting. Their new class room is upstairs and overlooks the whole store. 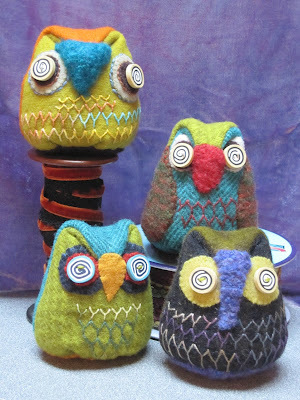 To my delight they have added some yarn and Clarice is the new yarn expert. The students were great many new as well as familiar faces. I was also delighted to see Julie, Patti and Diane who came down from Missouri. 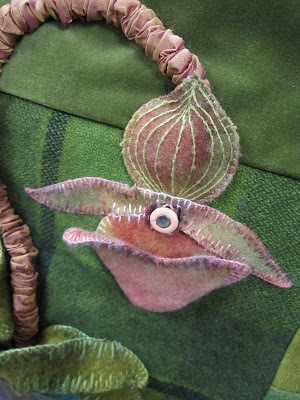 We worked on embellishing leaves for two days using lots of great fibers, beads and silk threads. The other class was the small bird project. I love Westminster fabrics and we spent time fussy cutting them to layer our leaves and berries. Jane West brought her little zipper bag which she complete from last years class. I love the colors and buttons she used. 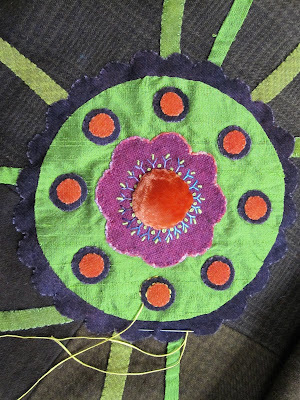 Biddy Pyle from Bella Vista, AR is working on my Flowerbed Quilt. 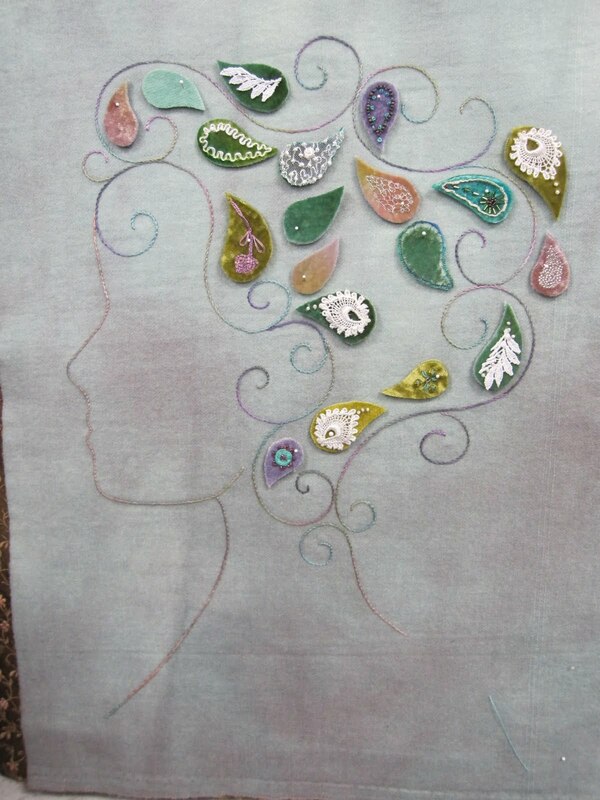 Is this not fun appliqued on all taffeta silk backgrounds! I am sitting in Chicago now on my way home. First thing in the morning I will be finishing up the October newsletter which will include the new 2011 BOM. Look out for it later this week. 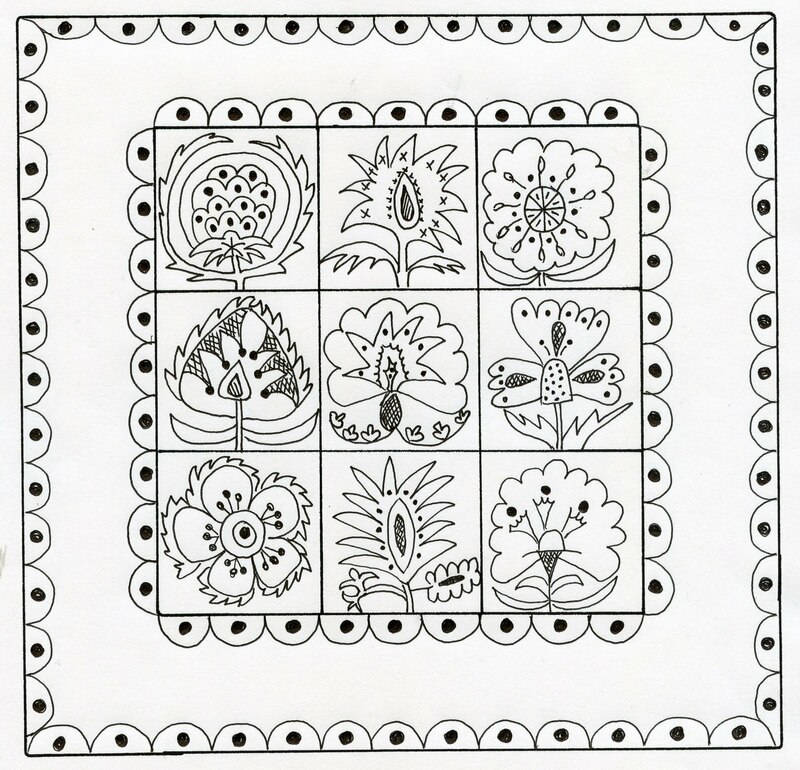 I am very excited as I think it is going to be so much fun to stitch. Calgary was wonderful! Great weather, enthusiastic students and lots of lovely creativity. My dear friend Deirdre is the owner of ‘Out of Hand’ in Calgary which is filled to the brim with lovely fashion and quilting fabrics and to die for embellishment threads. 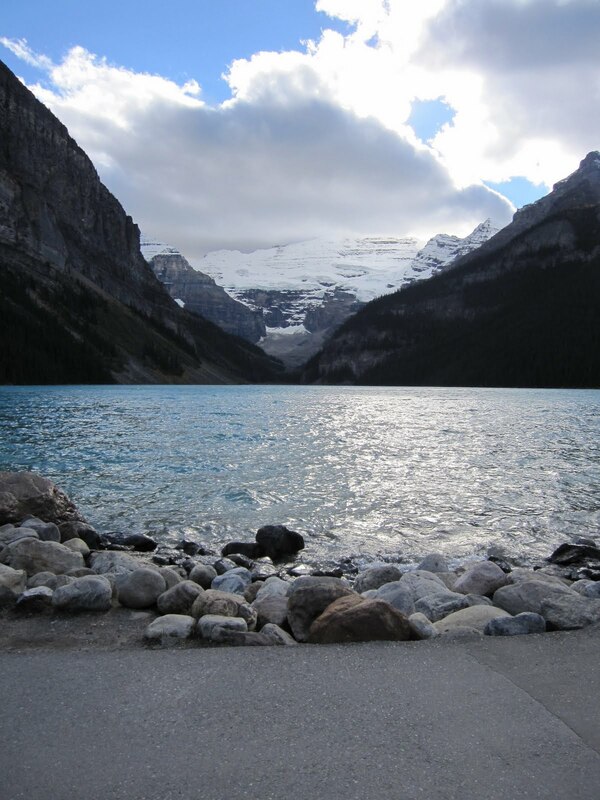 It is a treat to teach there as we have every texture available right at out finger tips. I taught for five days, two days of leaves, two days of ‘Robin Run the Hedge’ and a day of my small bird embellishment class. How creative is this leaf project by Maureen using the leaves as hair in this silhouette. I can’t wait to see the finished project. Maureen also made my Victoria Tote using her own creative floral block for the front. I just love the dimension she created with the stem, flower and leaves. We were spoilt each day with wonderful treats for tea. 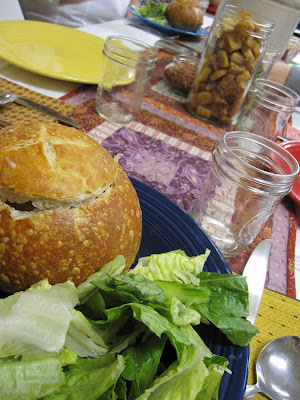 How do you like these little hamburger cakes? I don’t think I will ever get tired of creating leaves. Every class seems to come up with something unique. The color and texture you can achieve is just amazing. 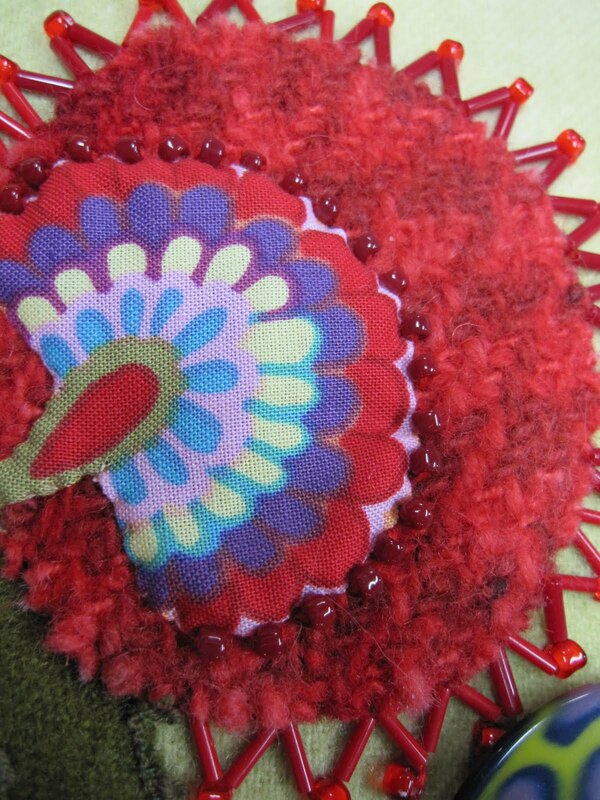 I really think it is time to write an embellishment book. Mary Jane Cioni brought her ‘Greenbrier’ Quilt to show me. I just loved the embellishment she did on these flowers. 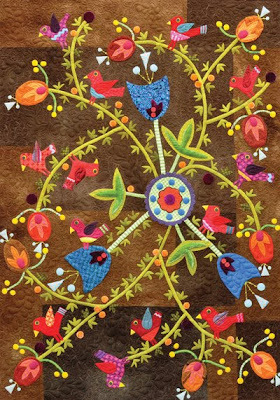 The small bird quilt was fun. We fussy cut fabric, embossed velvet and created stitches. It is always great to have no rules and see how creative everyone becomes. 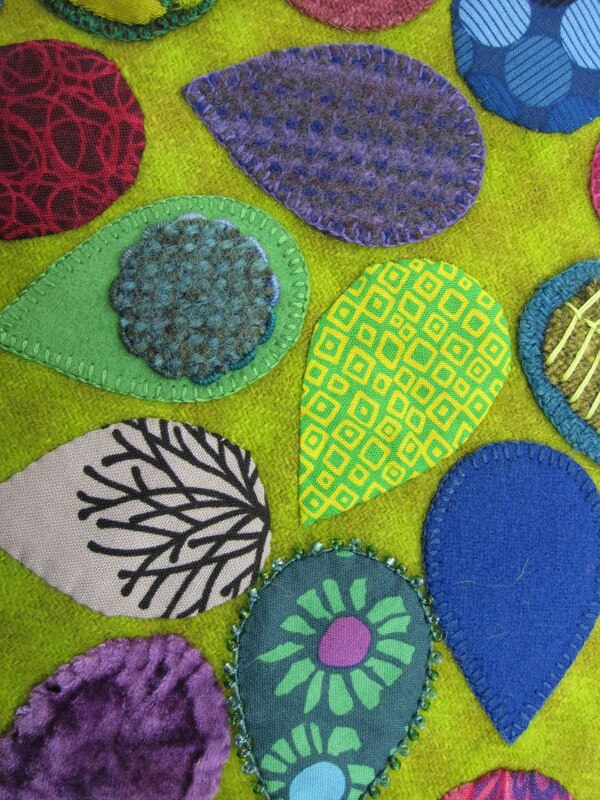 Many worked on the center of my ‘Robin Run the Hedge’ quilt. 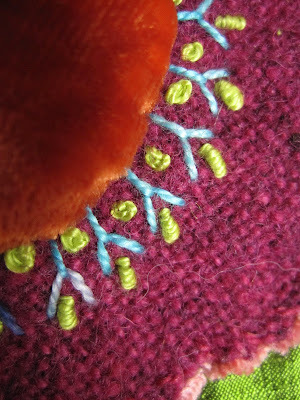 Beading, stitching and using textural threads. Marlene loves the Southwest and decided to make her small bird piece into a cactus with dimensional blooms. She really did well achieving color and dimension in her flowers and texture on her cactus. Thanks to Deirdre and all my students for making my stay fun and creative. As always I look forward to returning in 2011. Every time I have been to Calgary Deirdre has wanted to take me to the mountains in her red TT. It has always snowed. 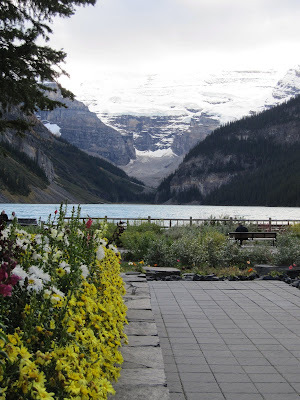 This time I beat the bad weather and after class we had a wonderful day in the Rocky Mountains with an English tea at Lake Louise. It was spectacular! I sometimes have to pinch myself. Can you imagine being so fortunate to be able to travel to such wonderful places and be surrounded by so many creative people everyday. I think I must have the best job in the world! Many thanks to each one of you who touch my life and encourage me to grow.